Where do these kitchens exist? First, they show these large immaculate kitchens (not on a planet with small children) with NOTHING held to the fridge with a magnet (also not happening with children). Second, they decorate in lots of WHITE (not on a planet with boys). Also, everything, even the zip-locks and cereals, are labeled. There are containers to hold the containers that hold the food, cleaners, or office supplies. Don’t get me started on the kitchen with room for vitamins, medications, and office supplies. I know those exist only in my dreams. Whatever. I need the quick and dirty version. Okay. Quick, and not so dirty. As I work along in the next month of Operation Get My House Under Control, I’ll let you know what I honestly think is worth the time and what’s not. Hopefully by the 4th of July everything will have a place and come out smelling like roses. Lets just say I have an excellent place to start. « Bikini or Brazilian? Do you prefer rum or Cachaca? HA! 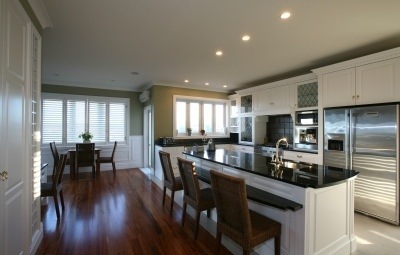 These kitchens only exist on Pinterest and Houzz.com!! 😀 Cleaning house with kids around is like shoveling snow during a blizzard. Getting the kids on board helps tremendously, of course. You already know that. 🙂 And personally, I prefer a house that has kid pictures on the fridge and stray toys out and about. It says that house is lived in, there is a lot of love, and I shouldn’t be afraid to breathe there for fear of leaving a smudge or something, haha! !